« first tree of the season is up! If you don’t know already, I *love* Christmas and everything about it. I love the decorating, the entertaining, the cooking…every detail. Here’s a little preview of what’s coming. 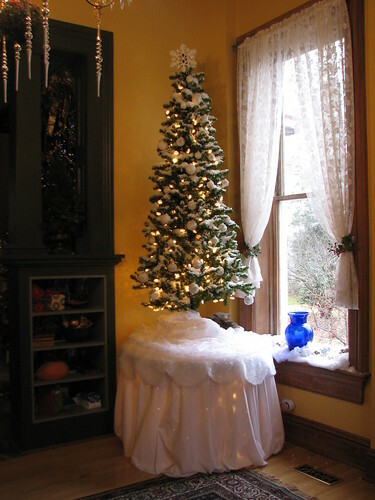 The living room tree is a 9′ tree that sits on a 24″ box. The ceilings are 12′ high. The tree rotates. Years ago, I found a heavy duty revolving tree stand. I have searched the internet and cannot find the same tree stand available any longer. Ones that *are* available couldn’t handle such a large and heavy tree. The stained glass angel in the window is a gift from our dear friends Gary and Laurie and hangs in the window year round. Gary made the angel and other stained glass pieces in our home. 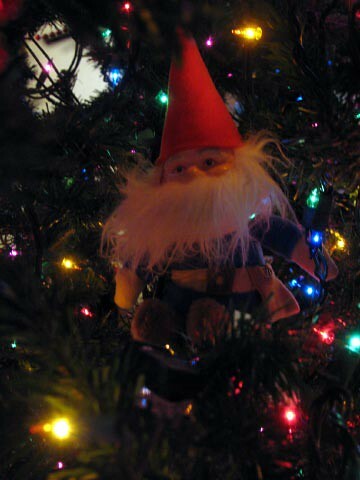 If you’re here at Christmas time, peek inside the living room tree to find the wood gnome who hides inside. 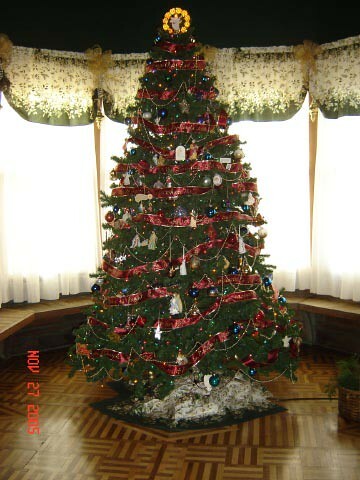 The main tree in the dining room is decorated with snowball ornaments and is covered with shredded artificial snow. 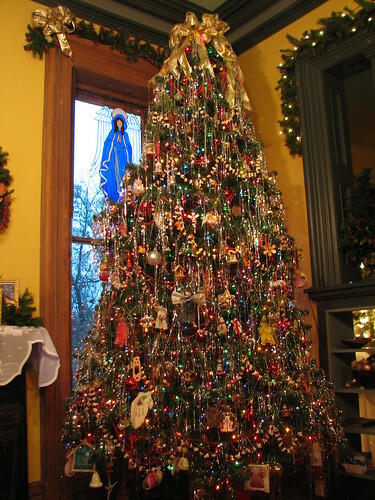 This tree sits in the bay in the library and holds a large collection of nativity related ornaments. It’s wound with a ribbon on which I wrote the Christmas story from Luke 2:1-20. I used gold fabric paint and wired satin ribbon. 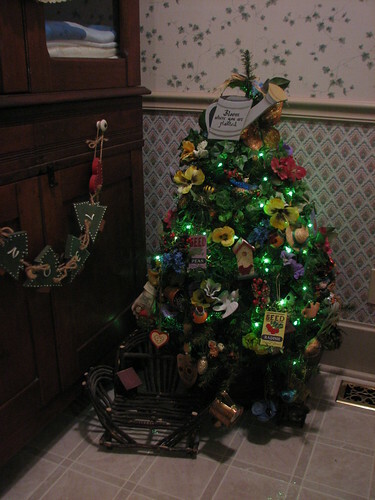 A favorite last year, of course, was the grandbaby tree. This tree was a lot of fun to make. 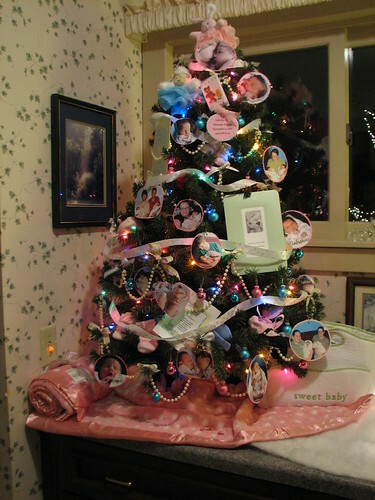 Dear friends gave us a “grandpa / grandma” gift of a diaper bag, two soft blankets, little socks, bath scrubbies, etc., and I used those to decorate the tree along with cards we received and photos of the twins and family. 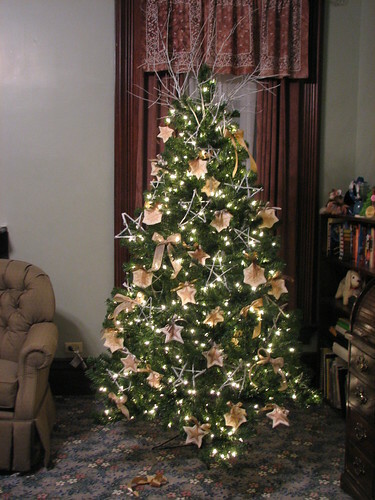 The tree in DD#2’s room last year was decorated with stamped felt ornaments, wooden stars, and bows. This year, I’ll add some of DD’s own photographs and copper colored balls. My favorite tree is the “glass tree” in our bedroom. 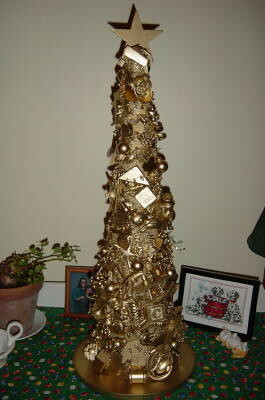 I collect spun glass and glass ornaments and they go on this tree. 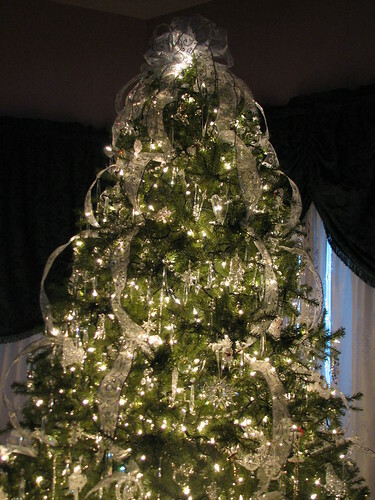 I dismantled several chandeliers and use the prisms (about 250 of them) on this tree along with the crystal chains as garlands. 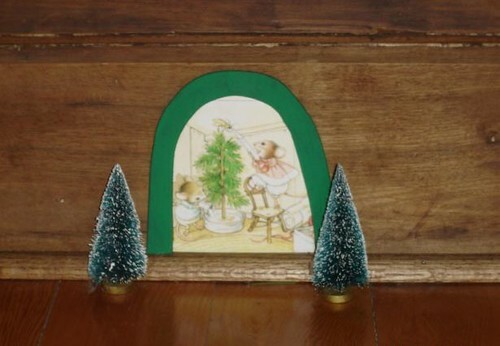 Even the mice are decorating a tree. 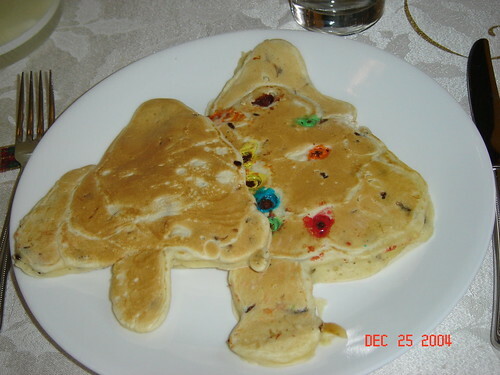 And you may get a Christmas tree for breakfast! You can click on any of the pictures and it will take you to my flickr site where you can see pictures of our other trees. Christmas decorating is usually well underway by now because we have to have it all ready by the first of December for our annual open house. We are definitely going to fall behind schedule this year because of our remodeling projects, but I’m sure it will all come together in the end. Reviewing some of our pictures from previous years gives me a taste of what’s ahead. I can’t wait to get started in earnest! This entry was written by ~~Rhonda, posted on October 4, 2008 at 11:14 pm, filed under Christmas, decorating for Christmas, trees and tagged Christmas, Christmas decorating, christmas tree. Bookmark the permalink. Follow any comments here with the RSS feed for this post. Post a comment or leave a trackback: Trackback URL.